Stone Veneer. It looks like real stone because it is! 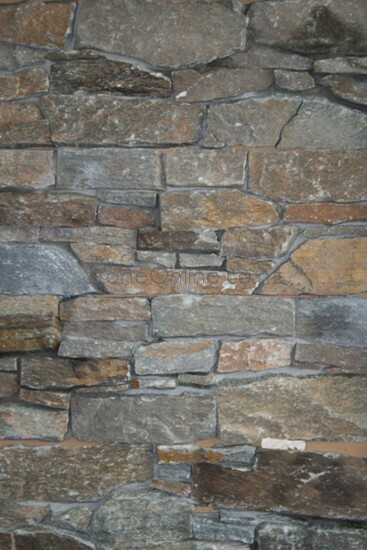 Our Sumner Stone Veneer is real stone cut thin for easy application. Let's compare Sumner veneer to other feature walling products. First it is good to understand the difference between solid stone and our Sumner masonry stone veneer. 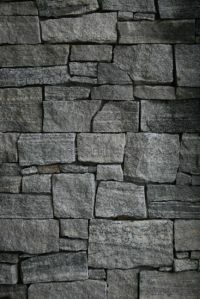 Solid stonework is also known as traditional stonework. It is at least 150mm thick and weight loads to a footing. 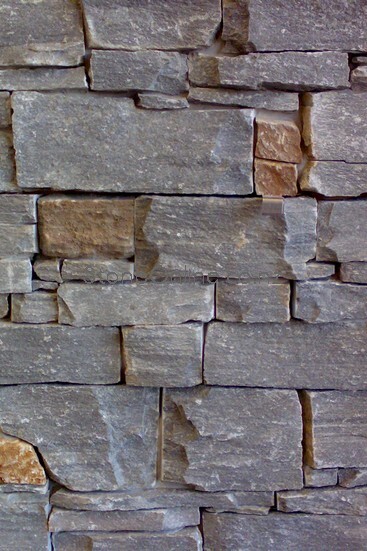 Stone Veneer is usually 30mm thick, and transfers its weight to the structural wall. It makes sense that cladding an internal stone fireplace is much easier with a veneer. We will illustrate why this is also true for external facades, columns and feature stone walls. Sometimes even freestanding masonry walls. See our free demonstration video on the right. It shows us installing Sumner to a timber framed column. The low price is the most obvious advantage. 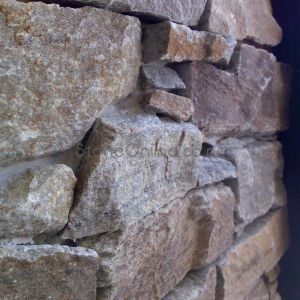 Stone veneer is more affordable than traditional walling stone for the following reasons. Firstly stone veneer does not require structural footings. This translates into considerable savings. There is no need to calculate footing requirements. Neither do you need to outlay money for concrete and steel. It's just not needed. Secondly stone veneer has a much lower installation cost. The cost is similar to tiling. Loose stone however is three times more expensive to install! Avoid OSH complications associated with loose stone. This is particularly appealing for large contract work. Sumner Veneer weighs less at around 80 kilograms per square meter. This means less effort carrying it upstairs. Also reduced stress on your building frame. This makes Sumner a smart choice for multi story dwellings. Especially when cladding columns or chimneys. Sumner veneers are colour fast. They do not fade or lighten as stated in our 15 year warranty. Artificial stones have trouble with retaining their colour long term. Reciently we were contacted by a home owner whose imitation stone turned pink. Unfortunately he splashed driveway cleaner on his house. That was all that was needed to turn the oxides in the artificial stone pink. Something no one wants. We can ensure this with every installation. Our panels are square and easy to level. The staggered ends ensure there is no vertical seeming. However loose stone is reliant on the skill of the installer and you do not know if he is capable until completion. With Sumner you know you will get a good installation. New Generation of Schist Veneer, Available Now! This Season we have introduced three popular new stones. They are look in every way to be traditional schist. Please see for yourself by following any of these links. I do not need to elaborate on these. Sumner is already appraised to conform to these building code classifications. Right now we are the only medium weight veneer that does! By employing our system are clients assured of compliance. Local councils will not issue consent for non-conforming installations. They may even instruct these installations to be pulled down! Please contact us if you wish to discuss your project. All products are available here online. You may want to look at our section on obtaining a quote. Try our new instant quote! This is a free tool with no obligation. It converts your square meters into components. This makes it easy to order from our online shop. Enjoy browsing our supplemental Stone galleries. You can download free brochures here. Feel free to contact us with your questions. Please read our FAQ pages first.